A few weeks ago…actually, it’s been more than that. A month, maybe? Yiiiikes. Anyway, [insert some amount of time that isn’t as long as it’s actually been] I participated in Blonde Undercover Blonde’s and The Nerdy Katie’s Book Swap. And, awesomely, I was paired up with Myra, who didn’t flake out on me (like my very first swap partner, not that I’m bitter—okay, I’m actually still a little bitter, like bitter-lite). There was a small snag when she sent me a book that I’d already read: Bossypants by Tina Fey, but Amazon is cool with exchanging things as long as you don’t download them, so I was able to pick another book instead. 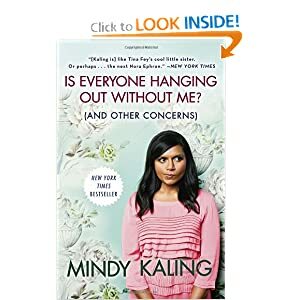 Keeping with Myra’s theme, I chose Mindy Kaling’s Is Everyone Hanging Out Without Me? (And Other Concerns). Now, to be fair, I think that watching The Mindy Project added to my enjoyment of this book. Mostly because I was able to hear it in her voice. I’m also a fan of The Office, so there’s that, too. And really, this is somewhat redundant because if you’re interested in reading this book, it’s probably because you also watch The Mindy Project and/or The Office. But if not, I’d suggest watching either because being able to hear Mindy’s mile-a-minute, somewhat nasal voice makes her punchlines…well…punchier. Okay, on with the review. This book was funny. Not Bossypants funny, but funny nonetheless. However, it wasn’t Mindy’s accounts of her work that I found the most amusing. It wasn’t that I didn’t enjoy those sections but the parts I liked the best were her unique take on the world. As in, how she lives her life. Consequently, I now totally want to be her friend. One of my favourite chapters was titled: I Love Irish Exits and it’s pretty much when I fell in hetero-love with her. Irish exists are supposed to be subtle, a way to leave without creating a disruption, and yes, on occasion, a way to perhaps escape notice for epic drunkenness (Ohemgee, I love her). The only snag is that you have to be comfortable lying directly to the faces of people you like (Seriously, Mindy. I want to be one of the people you have to lie directly to). She then describes a situation where she needs to pull an Irish Exit because her ex shows up to a party with his new girlfriend (something that we can all sympathize with, right ladies?). A word about Chloe (the new GF, who coincidentally has the same name as my grade-school nemesis. Don’t worry Mindy, I hate her already). Chloe was so young (or young looking) she’d actually played the daughter of an actress four years older than me on a TV show. But the worst thing about Chloe is that she was sweet. CHLOE (shyly): Can I just say you’re my hero? I took the Long Island Rail Road out to see Matt & Ben when I was in middle school. Don’t you dare, Chloe. Don’t you dare make it impossible to hate you. Quit looking at me, all earnest, with those Bambi eyes. Also, I’m your “hero”? What am I, ten thousand years old? I quickly said something weird like, Bless you, child,” excused myself, and walked briskly away. I went over to Louisa, who was standing with my friend Pete when I began to initiate an Irish Exit. Another favourite chapter was: Non-Traumatic Things That Have Made Me Cry, which included: Valet guys who are her Dad’s age, Mark Darcy, and Joni Mitchell’s Blue. Mindy is also very much pro-male-chest-hair and dedicated a shorter, yet complete chapter to the cause. Awesome. Yes, there are times where Mindy is borderline racist but she manages to finagle her way out of those uncomfortable moments by (a) acknowledging that she's teetering over the line and (b) being funny. And, despite it not being a solid 10 on the hilarity scale, it’s still an 8. That is, of course, unless Mindy wants to hang out with me, which will bump that number right up. I so want to read this! Maybe I will save it for our epic plane ride this summer so I can laugh on the plane and be obnoxious! oh my word,i literally just started this book last night and find it HILARIOUS because like you said i can totally hear/see Mindy saying all this. I loved this book! I actually listened to it on my iPod so I got to hear it in Mindy's actual voice. I nearly laughed myself off the treadmill. I loved Bossypants (also on my iPod) too! I read this before the Mindy Project came out, but I had caught her a few times on The Office and it really helped knowing her voice when reading this. I totally agree with you, I want to be her new bff! I think I love her because she's just so real,describing situations that I've actually been in or could see myself being in, and reacting similarly! Great review! i still need to read bossypants! !